We present an overview of current real-time massive model visualization technology, with the goal of providing readers with a high level understanding of the domain, as well as with pointers to the literature. • Large-scale engineering projects. Today, complete aircrafts, ships, cars, etc. are designed purely digital. Usually, many geographically dispersed teams are involved in such a complex process, creating thousands of different parts that are modeled at the highest possibly accuracy. For example, the Boeing 777 airplane seen in Figure 1a consists of more than 13,000 individual parts. • Scientific simulations. Numerical simulations of natural real world effects can produce vast amounts of data that need to visualize to be scientifically interpreted. Examples include nuclear reactions, jet engine combustion, and fluid-dynamics to mention a few. Increased numerical accuracy as well as faster computation can lead to datasets of gigabyte or even terabyte size (Figure 1b). • Acquisition and measuring of real-world objects. Apart from modeling and computing geometry, scanning of real-world objects is a common way of acquiring model data. Improvements in measuring equipment allow scanning in sub-mm accuracy range, which can result in millions to billions of samples per object (Figure 1c). • Modeling natural environments. Natural landscapes contain an incredible amount of visual detail. Even for a limited field of view, hundreds of thousands of individual plants might be visible. Moreover, plants are made of highly complex structures themselves, e.g., countless leaves, complicated branchings, wrinkled bark, etc. Even modeling only some of these effects can produce excessive quantities of data. For example, the landscape model depicted in Figure 1d measures “only” a square area of 82 km × 82 km. Handling such massive models presents important challenges to developers. This is particularly true for highly interactive 3D programs, such as visual simulations and virtual environments, with their inherent focus on interactive, low latency, and real-time processing. In the last decade, the graphics community has witnessed tremendous improvements in the performance and capabilities of computing and graphics hardware. It therefore naturally arises the question if such a performance boost does not transform rendering performance problems into memories of the past. A single standard dual-core 3 GHz Opteron processor has roughly 20 GFlops, a Play station 3’s CELL processor has 180 GFlops, and recent GPUs, now fully programmable, provide around 340 GFlops. With the increased application of hardware parallelism, e.g., in the form of multi-core CPUs or multi-pipe GPUs, the performance improvements, which tend to follow, and even outpace, Gordon Moore’s exponential growth prediction, seem to be continuing for a near future to come. For instance, Intel has already announced an 80 core processor capable of TeraFlop performance. Despite such an observed and continuing increase in computing and graphics processing power, it is however clear to the graphics community that one cannot just rely on hardware developments to cope with any data size within the foreseeable future. This is not only because the increased computing power also allows users to produce more and more complex datasets, but also because memory bandwidth grows at a significantly slower rate than processing power and becomes the major bottleneck when dealing with massive datasets. As a result, massive datasets cannot be interactively rendered by brute force methods. To overcome this limitation, researchers have proposed a wide variety of output-sensitive rendering algorithms, i.e., rendering techniques whose runtime and memory footprint is proportional to the number of image pixels, not to the total model complexity. In addition to requiring out-of-core data management, for handling datasets larger than main memory or for providing applications the ability to explore data stored on remote servers, these methods require the integration of techniques for filtering out as efficiently as possible the data that is not contributing to a particular image. 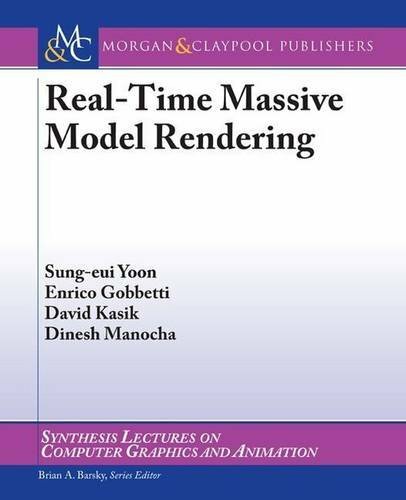 This article provides an overview of current massive model rendering technology, with the goal of providing readers with a high level understanding of the domain, as well as with pointers to the literature. The main focus will be on rendering of large static polygonal models, which are by far the current main test case for massive model visualization. We will first discuss the two main rendering techniques (Section II) employed in rendering massive models: rasterization and ray tracing. We will then illustrate how rendering complexity can be reduced by employing appropriate data structures and algorithms for visibility or detail culling, as well as by choosing alternate graphics primitive representations (Section III). We will further focus on data management (Section IV) and parallel processing issues (Section V), which are increasingly important on current architectures. The article concludes with an overview of how the various techniques are integrated into representative state-of-the-art systems, and a discussion of the benefits and limitations of the various approaches (Section VII).